Born in Philadelphia in 1961, Gene Jackson had already determined by his late teens to become a professional drummer. He attended Berklee College of Music where his classmates numbered Branford Marsalis, Cindy Blackman, Terri Lyne Carrington and Jeff "Tain" Watts to name just a few. He's worked with many major players in jazz including Dave Holland, Herbie Hancock, Wayne Shorter and Kevin Eubanks. For his debut album as leader, Jackson has shrewdly selected two truly inspired musicians. Listening to the opening number, Cole Porter's "I Love You" might give the impression that this is an album of standards but that's far from what's on offer. Carlo De Rosa's luscious, deep bass is a particular standout here. "Great River," one of two Jackson-penned numbers, is a jaunty, angular piece with an eccentric dragged beat. The only other non-originals are two Thelonius Monk tunes, the upbeat "Played Twice" and the more conventional ballad "Ugly Beauty," which spotlights pianist Gabriel Guerrero, whose playing is both assured and sensitive throughout the album. Following a sombre opening with thunderous drums and arco bass, Guerrero's "Land Of The Free" breaks down into a much looser arrangement, but holds together cohesively before reverting to the opening head. "Peaceful Tremor" written by De Rosa, is, as its title implies, a delicate composition, performed at a largo tempo, Guerrero's dulcet piano accompanied by Jackson's brushed drums and De Rosa's sonorous pizzicato bass. Jackson's "Before Then" gathers pace with Guerrero's fleet-footed piano work dominating, closely mirrored by Jackson's crisp drumming and De Rosa's resonant bass, both of which are showcased in solos. The album concludes with Guerrero's "Lapso," which oscillates between languidness and excitingly vibrant sections, all sewn together seamlessly. In its 67 minutes, this album yields a myriad of beguiling ideas both in terms of composition and execution. It also highlights the sheer versatility of Jackson's percussive talents within this heterogeneous set. Track Listing: I Love You; Great River; A Peaceful Tremor; Lighting; Played Twice; Land Of The Free; Neptune; Ugly Beauty; Before Then; Lapso. 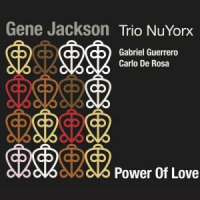 Personnel: Gene Jackson: drums; Gabriel Guerrero: piano; Carlo De Rosa: double bass.